Le WorkCentre Pro 765 n'est plus commercialisé. 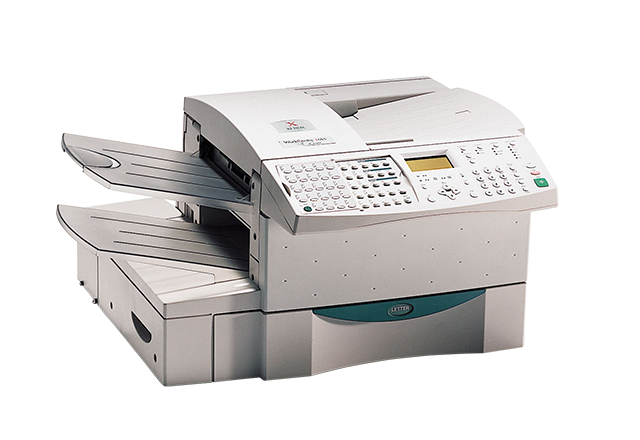 The WorkCentrePRO 765 is a rebrand of the Toshiba DP120F, but is a dual line fax. It has PC connectivity as standard, and optional Internet and network connectivity. This fax is speedy: both modems are fast 33,600bps and compression is up to JBIG. Quick scan is fast - 1.2 seconds. There is an enormous 700 page memory (7MB) which should be ample for both lines. Printout is nippy at 12ppm. The 400dpi PC scanning quality is also good. There are a generous number of speed dials. This machine can both initiate a relay broadcast and act as hub. Security features include 100 confidential mailboxes. Paper handling is good with a 50-page ADF and standard receiving paper of 550 sheets. In addition, quoted cost per copy is low. This is an easy BEST BUY. Reproduced with permission from What to Buy for Business, Edition 232, July 2000.